Health Data Vision, Inc. welcomes you to episode 2 of The Value-Based Healthcare Podcast. 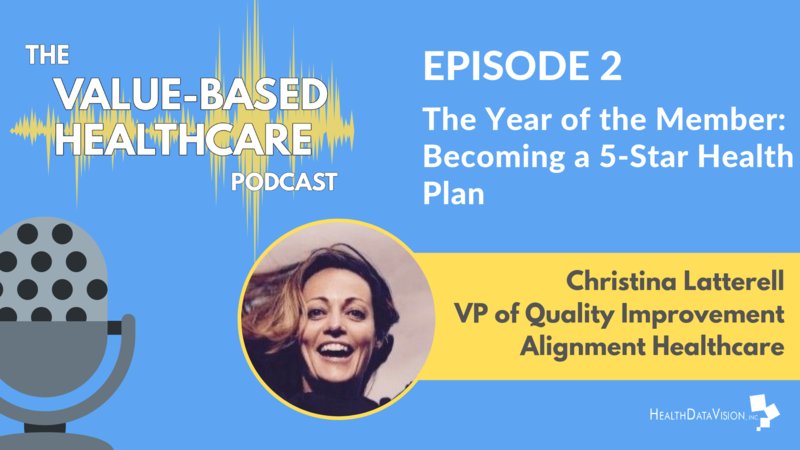 Our guest on this episode is Christina Latterell, VP of Quality Improvement at Alignment Healthcare. Hello and good day. I'm Jay Ackerman, CEO of Health Data Vision. We are a software and services business committed to providing health plans with innovative technologies to maximize the return from HEDIS and risk adjustment initiatives, a must in the value-based care world we operate in. I'm back with session number two of our podcast series entitled ‘Succeeding in a Value-Based Reimbursement World.’ Through our podcast we aim to widen visibility and voice the people shaping significant functions inside of health plans. I'm pleased today to be joined by Christina Latterell, VP of Quality at Alignment Healthcare for our second podcast. Please enjoy this podcast and feel free to share it with others and promote via social media. Christina has been in healthcare for much of her life. She grew up in a family with both parents involved in healthcare. One is an administrator and another is a nurse. She learned clinical process early on, pretending to check-in patients after-hours and adding postage to patient billings. She has demonstrated success in developing and implementing clinical quality metrics, achieving cost reductions, improving satisfaction with both internal and external customers. She hails from Minnesota, but now calls California home. And now with that, let's hear from Christina. Hi, Jay. Thanks for having me. Yeah, my passion truly lies within the Medicare product line and helping people with the Medicare program benefits. And as we talked through the podcast here, we'll talk a little bit about what I perceive as some of the challenges and barriers with Medicare Advantage product. Awesome. Well we can't wait. So Christina, first off, so you grew up in a household that kind of wrapped around healthcare. For some that often pushes them in another direction, but for you that drew you into healthcare. Can you share a little bit more about that? Sure, it absolutely did. Initially I had taken a path where I thought I was going to become a lawyer. I actually was pre-law for two years prior to making the shift back into the healthcare world. My father, like you said, was an administrator for many years. He's teaching now and my mother recently retired at the end of November from 30 years of service within the VA Medical Center. She started off as a nurse and worked her way up through management and ended up being a Chief of Services there with the VA in Minneapolis and had quite a bit of experience in healthcare. I initially thought I was going to get out of healthcare, but it just seemed to pull me back in. And I think what's its a passion, its always a passion. You come back to what you know. And that passion drew you to an innovator in healthcare and Alignment. So maybe you can share what brought you to Alignment. A company that's going through a lot of change, and trying to bring about a lot of change in healthcare. Absolutely. A funny story, I was looking for a new role and new opportunity from the organization that I was in and Alignment had outreached to me. But at the same time, I was doing some consulting for a venture capitalist in Manhattan, and also interviewing for a role in Dublin, Ireland, to help bring a clinical call center to Ireland to speak with the US population with the thought that they would be more apt to engage with the Irish because of the way they speak. But when Alignment presented was an opportunity to take healthcare and leverage technology and drive that throughout the industry to bring outcomes that were incentive-based, which then would be applied back to that Medicare product line. And so for me, the ability to implement change and in a nimble environment, being a late stage startup that Alignment wanted, it really drew me. I have that innovator, thought and concept and always have, so it was a great opportunity and I'm very thankful to be a part of this team. In your time at Alignment, how of your responsibilities changed, and how is it that you're overseeing the Quality organization? I think they change on a daily basis here at Alignment. And I think within any organization, when you work in Quality improvement, it takes an individual to know and understand operations. I started off building the Medicare STAR program here at Alignment. They were stuck at a three STAR rating. They needed somebody who understood the Medicare STAR program and so they asked me to come be a part of the team to help build that program within the organization. Within about a seven month period of time, I started here in May of 2016, we took the organization from that three STAR rating to a four and a half STAR rating within that seven month period of time. Just modifying operations and building the right structure and putting the right people in the seat in the bus so that we could ensure that we were meeting the needs of that population, the Medicare Advantage people. So that's pretty impressive improvement in such a short window. How about the goals that you have looking forward? Can you share a little bit about them? Sure. My goal is always to be that five STAR Medicare Advantage plan and organization is rallying behind that. Right now, there are some areas of challenge that we have as other organizations have different types of challenges. And one is right now the member perception of the access that they receive. And so we're putting a lot of focus there in order to get us to that five STAR goal and five STAR plan. If we could do that within California, we'd be the only non-integrated health plan that would hit that five STAR level. We're working on it. We're getting there. But that is definitely a goal for us. Can you share anything about the timeline around trying to hit that? Do you think that's something that you can get to in the next 12 months? Is it 24 months out? So what does that look like? Yeah, we're working on it. Definitely an opportunity and possibility if we can make some changes with our new, what we're calling our ODPC or member facing benefits. We've got some new products rolling out this year and since ‘18 is almost over, I think it's okay for me to talk about it right now. But we have new telehealth benefits for members, we've created a more reward program for individuals, we're rolling out with some new technology that will allow individuals to engage more easily within their healthcare, bringing transparency through these tools and technology. We're also leveraging what we're calling a ‘black card,’ allowing members to use that as a credit card and they'll be receiving their OTC benefits over that black card process and also their member reward program, leveraging many different OTC and pharmacies within the area. So it's really bringing consolidation to a lot of different member programs and focusing on the members themselves this year. It's a year of the member. Fantastic. Well I appreciate you sharing that. And that's a fairly ambitious agenda. So good luck as it unfolds. Let's talk a bit about the industry and some of the change that you see taking place more broadly. What trends do you see that are beneficial to Alignment Healthcare? I see changes to the Medicare STAR program itself with CMS codifying the program this last year, it brings more visibility to changes. So it allows organizations like Alignment to make needed operational shifts. But they're still remains challenges, like there's often changes within the program that aren't clear as to how they integrate into the STAR program. So if organizations are highly matrixed and don't have that thread through, they're not going to see the benefit of some of these changes. For example, there was a change recently by NCQA to the HEDIS all plan cause readmission measure, which in the future will include observation stays as well. What’s going to happen is we're going to see a shift in the industry to put more focus on observation management, because one of the techniques in the past I think, from the clinical side of the world has been to shift from inpatient to observation to help prevent that readmission status. When now moving forward, it's going to actually be counted in this metric and measure. So we’ll probably see a shift more towards that outpatient management even push further from ED or inpatient observation statuses. How do you see changes such as that impacting your organization specifically, and kind of how you manage your agenda and priorities? Yeah, I think it just depends on the change, you know? Some can be positive, and some can be negative. It's like the all plan cause readmission. I think it's going to add cost burden to manage this more effectively. But if we can push it out, you know, the thought is, is that the outpatient setting is more appropriate for care which will allow for ultimately a cost reduction. But I think at first in order to manage this big of a change it's going to be an impact to the dollar amount needed. And staying on top of it is monitoring memos and CMS communications any bit and piece of information that they can send out and notify the Medicare Advantage plan. I think I probably receive an average of between two and three emails from CMS on a daily basis. Just talking about changes to the program. Yeah, I find it personally challenging just to try to keep up with the pace of their changes, particularly kind of, when they're cascaded down the timeframe to try to put our response into place. What do you see is the greatest barrier challenge that’s affecting your personal success in today's environment? Yeah, it's two things. One, with regards to the STAR program itself, if the threshold changes that come into play after the ability to impact, a change has taken place. So just depending on how everybody else is performing, you're graded in that way, which you completely understand it's continuous process improvement, but it also makes it challenging in order to ensure that you have the right resources in place on the thing that are going to be monitored. Also, I think it's patient-member understanding of the administrative burden to the Medicare Advantage plan. And, you know, CMS puts those administrative rulings in place to keep people whole and to safeguard the beneficiary themselves. But sometimes it can cause a lot of red tape and lack of fast turnaround time on things that they feel that they need. With the changes that you've just identified today and looking forward, how do you ready yourself and your team to address those challenges when they're presented? Real-time leading indicator reports, monitoring things that don't necessarily have an outcome impact, and the overall STAR rating. But knowing and understanding their regulation, we know that they could be upcoming. So we’re monitoring things that don't necessarily need to be monitored from a program perspective, but from an overall individual perspective are important. For example, one of the things that we're implementing this year to better tighten controls around some of the caps related measures to the STAR program, implementing operational metrics into the provider community that tie into members’ perception of access, such as grievances, CTMs from specific providers, any trends we're going to roll that up into a caps related measure, and we're going to monitor people on that. We're also assessing turnaround times for appointments, rolling that up into a STAR-related measure. And that's really holding people accountable for that perception that an individual perceives. Any advice you'd want to share around trying to introduce changes like this to your provider setting? Yeah, I think definitely it helps if individuals within the provider setting, understand the rules. And coming from the provider setting for about a third of my career, I also understand that it can be challenging implementing different rules for different health plans. But I think that if a provider group is going to be seeing the Medicare population, the Medicare Advantage rules should be similar from an operational perspective to help ensure that beneficiary regardless of whom the Medicare Advantage program is, that they received the type of care that they perceived that they need and which that Medicare Advantage program is being graded on. Christina, these insights and feedback have been great around the broader set of changes taking place in the industry. How about we turn a little bit now, maybe internally for a couple of questions. So if you find yourself in an elevator with John Kao your CEO, what might you tell him about your business goals and priorities? Actually I’ve have been caught in this situation, it was interesting. John was being told that the health plan was going to be a three and a half STAR. And I actually accepted the position under those pretenses as well. And I think it's about day three, I had done my research and knew that the organization wasn't going to hit that three and a half STAR rating based off of the prior year performance. And he caught me at the coffee machine and I had to tell him no, that that wasn’t the fact, and it caused quite the frenzy. But I think for me, the relationship that I have with John is just being honest and open with them, and letting him know exactly what is happening and what's not happening operationally within this organization. Him and I share the same goal to get to a five STAR plan and that is my aspiration. And so some of the things that we talk about quite frequently are the member impact and member perception, because that's an area where this organization is putting our time and attention and resources to get us to that five STAR class. So you navigated the first meeting. And the next one, what request might you make of John or members of the leadership team? We meet daily. So this shouldn’t surprise anybody but, putting the focus on the member ensuring that they're receiving that coordinated care that they deserve and that Alignment’s so good at. It's ensuring that they're getting the access to specialists that they need on a regular frequency. That their voice is being heard when they're having a problem, so first call resolution from a member-service perspective. It is making sure they do have services, that they're getting their test results on time or copies of their medical record documentation so we can start to bring that transparency and foster a deeper interaction between that Medicare beneficiary or patient and their primary care or their specialist doctor. How about, I’m going to shift a little bit, if you don't mind. Can you share your thoughts on how our partnership is helping you achieve your success and your objectives? You guys have been great. I think your organization is so nimble and you partner so well with us. There's times when we asked for specific reports that maybe aren’t there or things that we need to see in a different way and you guys are always willing to help us with that activity. This year, towards the end of the year, we decided we were going to do some real-time chart chasings, and I think maybe within a week period, we had that project up and running. You guys always have this win-win attitude for both organizations. I appreciate that, thank you. So well, thanks for sharing that. That's nice feedback to hear. In this environment, just more broadly, what characteristics do you value in considering a business partner? I think everything that I just talked about. It's the ability to make change, depending on the need of our organization, it’s continued partnerships, it’s building those win-win situations so that everybody feels as if they're getting what they need out of that relationship. Great. Those are great to share. So as we bring it to a close, maybe you’ll indulge me with five lightning round questions. Rapid fire, no right or wrong answer. So we're going to move through them quickly. Just share what's top of mind for you. First off, what keeps you up at night? Constant regulatory changes, especially with this new OEP period. Yeah, I think I think we both are probably having some sleepless nights. Maybe one of those nights when you find yourself awake, what book might you grab from your nightstand and why are you reading in? Yeah, right now I'm reading the ‘Myth of the Garage.’ It's the entrepreneurial spirit in me. And it talks about being a lone ranger versus the reality of venture capitalism. And the book states about 91% of companies that are VC-backed actually have founders that are using their prior job experience. So it's an interesting concept and change fromstarting your business in your garage concept. I haven't seen that one, I’ll have to look that book up. Sounds great. Next, what major tech trend outside of healthcare do you think will have the biggest impact on the job you do? Oh, smart homes, absolutely. I think in the near future, we're going to start using the smart home technology like Alexa to do some smart scheduling for patients to remind them of services that they actually need to complete. I think eventually, we'll get to the point where we'll be monitoring gates to prevent falls, which are a large cost to the industry through maybe specialized floor boarding. So there's just a ton of opportunities with these smart homes. What's your favorite app on your mobile device? I’d have to say Facebook Messenger, just because it's how I stay in contact with my family. Alright, last one. How did you invest in yourself? I run. Running is the mental and physical release for me, and it just brings balance to this crazy life. Yeah, no kidding. I got on the road yesterday, which through the holidays, is a must. Yeah, absolutely. I'm training for a half marathon in July. Oh fantastic. Well, Christina, thanks for your time, and your openness. You’ve been a wonderful guest as I said earlier. This brings our ‘Succeeding in a Value-Based Reimbursement World’ podcast to a close. Please follow Health Data Vision on Facebook, Twitter, and LinkedIn. You may also follow me on Twitter @AckermanJay.